Next week, Intertops Poker and Juicy Stakes Casino are encouraging players to find out how quick and easy it is to use Bitcoins by giving them a choice of free spins on popular Betsoft slots or free poker tournament tickets. February 18-24, players that make a deposit using Bitcoins will get up to 20 free spins on a choice of four slot games or free tournament tickets for the online poker rooms’ Sundowner poker tournaments. 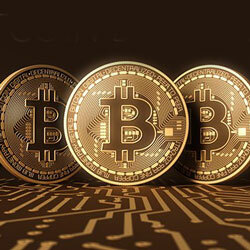 Using Bitcoins, there’s no need for any extra sign-ups or PIN-typing. With no intermediaries, no fees and no waiting time, sending coins across borders is as easy as sending them across the street. with a deposit of $25 - $70. with a deposit over $150. After their deposit, players must email their casino host (casinohost@intertops.ag or casinohost@juicystakes.eu ) to let them know whether they’d like a free poker tournament ticket or free spins on slots. $1000 GTD Sundowner Tournaments are held Monday through Saturday. Every Sunday there’s a $4,500 GTD Sundowner. Tournament times and details are available at https://poker.intertops.eu/en/promotions/tournaments and https://www.juicystakes.eu/poker/tournaments. All games are No-limit Texas Hold’em with various starting stacks and blind levels. Those that choose free spins can take them on any of these slots found under the Betsoft tab in the casino section of the site: Sugar Pop 2, Rockstar, Black Gold or The Exterminator. Free spins will be added to players’ accounts within 48 hours. Players can win up to $250 with their free spins. Bitcoin Bonanza details are available at https://poker.intertops.eu/en/promo/458-bitcoin-bonanza and https://www.juicystakes.eu/casino/offers/bitcoin-bonanza. These casinos welcome players from all over the world. In addition to their busy poker rooms on the Horizon Poker Network, they also offer slots and table games.